Hendersonville, TN (May 18th, 2016) – Award-winning family group, The Browders, celebrated outstanding success at Southern Gospel radio with friends and family at a reception held in their honor at BMI in downtown Nashville. 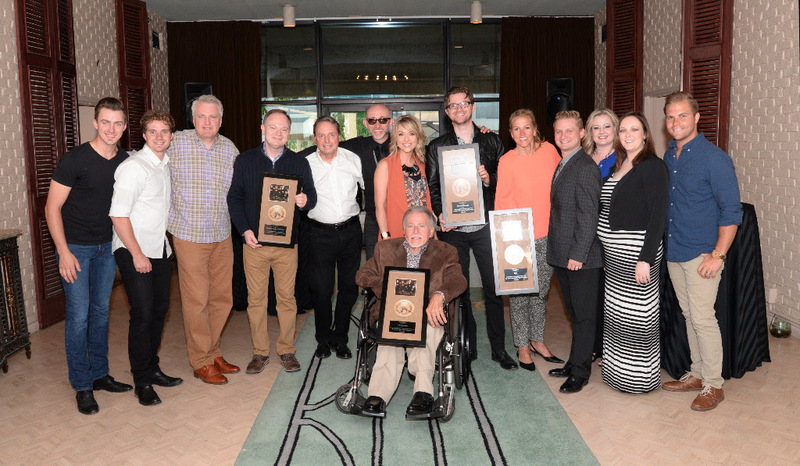 During the event, the Browders, as well as Daywind Records, Daywind Music Publishing and BMI, were presented with plaques to commemorate an unprecedented six consecutive number one radio singles from the 2013 project,Time Machine. The most recent single, “Waiting For You To Get Home,” reached the coveted #1 position for the month of April; having been preceded by singles “Lift Up His Name,” “He Is Alive,” “Time Machine,” “Listening For The Shout,” and “He Took The Nails,” which spent two months at the top of the charts. “We are so proud of the Browders’ achievement. Six #1 songs from one album is unheard of, and God continues to bless their ministry in many ways. BMI was so kind to recognize their work yesterday, and we are very appreciative,” shared Ed Leonard, President of Daywind Records. Time Machine is available at Christian retail stores across the country and digitally at iTunes and other outlets. Bulk purchasing for gift and ministry purposes is available by calling 1.800.635.9581. To order a copy ofTime Machine, visit daywind.com.